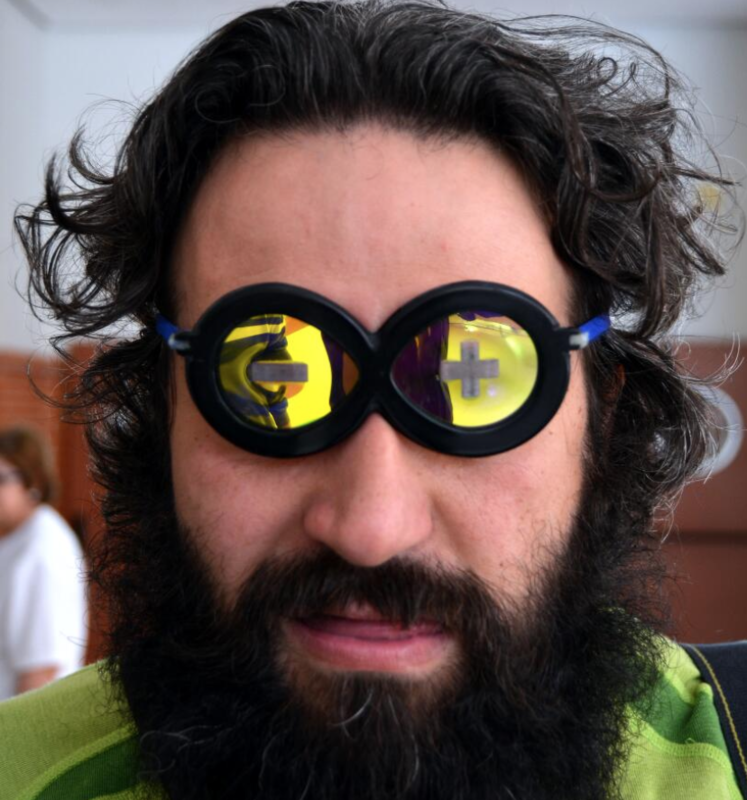 Arduino Blog » Arduino here, there, and at all the EDU faires! Arduino here, there, and at all the EDU faires! With the arrival of Spring, just prior to the ending of the academic year in Spain, teachers and education initiatives have been celebrating STEAM events all over the country. I personally attended RoboCampeones in Fuenlabrada, a small city outside Madrid, but there were a lot more: Robolot, FanTec, Cantabrobot, Granabot, ROByCAD, and even the technology and education conference PR3D. Arduino has been present in all of the above-mentioned events, as reported by many of the students, teachers, parents, regional representatives, and distributors, that were on hand. I had the opportunity of interviewing a whole lot of students at RoboCampeones as well as Victor, one of the organizers of many of the 15 editions of the event, and Mati, a teacher from one of the schools participating. Since the interviews were in Spanish and while I consider putting some work in making the subtitles to the videos, I have already published some of the interviews to the Arduino EDU LiveCast playlist, which you could find here. This is the interview made to Victor, the main organizer. In one sentence he said that RoboCampeones is the largest event of its type in Spain (CTC Catalunya 2018 had more students, but not coming from all over the country as in RoboCampeones). Mati, from the IES Sefarad in Toledo, comments about here experience and about how much students get motivated in making better projects year after year. 2018’s RoboCampeones represents the 15th edition of the event. It has not always been in Fuenlabrada, as it was an itinerating event for a while, and it has not always been having so much Arduino involved. In Victor’s words, it started as a Lego competition, but in 2011 through the intervention of Mati and her college Julio from the IES Sefarad school in Toledo, RoboCampeones added the “open category” to the competition. This category was not only opening up for the participants to use other technologies in the competition (which consisted of the traditional sumo, line following, and rescue challenges), but also brought in a couple of years later the possibility for students to present whatever project they had done in a faire-like environment. This year’s event had 2,000 participants, plus 1,000 kids that came just to watch. This is, in my opinion, an interesting trend that I have seen at the CTC Faires as well: not only do kids come to showcase their projects or to compete in challenges of different nature, they also come to see what others have done. It is certainly fun to observe some of the projects, see the robots fight on the tatami, and engage in endless conversations about how this or that has been built. 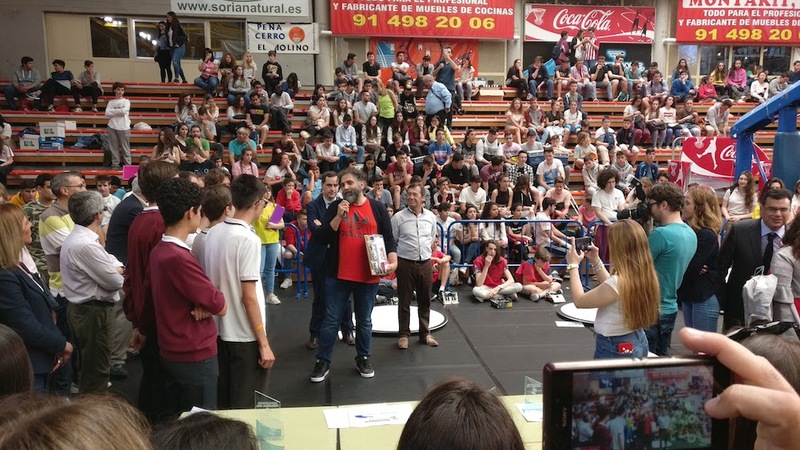 There were over 100 projects in the open category, which took a substantial portion of Fuenlabrada’s Fernando Martin basketball court (where the event took place), 176 Arduino sumo robots, and more than 20 different prizes. You can check out the pictures taken by one of our historical moderators to the Spanish forum and contributor to many open projects in Spain, Juan Manuel Amuedo aka @ColePower. At RoboCampeones, participants compete in getting the most points from the audience, in addition to being the best in the competition. The 2018 edition included a special challenge where teams had to build and command two teleoperated robots (using Bluetooth from cell phones) to compete in moving a certain amount of colored balls from the center to a corner of a squared tatami. Just imagine two teams, two robots per team (thus four players) and 16 balls of different colors rolling on the tatami… messy and fun at the same time! The other categories were: sumo, rescue, 3D printing, and the open category. I was invited to deliver the prize to the best Arduino project in the open category based on my opinion (yes, I had the chance to judge for a project all by myself!). It was a hard competition, something you can see from the videos. I loved a candy delivering box made by a bunch of 11-year-old kids from Jaen, the eco-friendly shower by three girls from the region, or the funny robot head for dancing at events by yet another couple from Madrid. However, if I have to choose a project that displays excellence in its execution, I voted for the solar airplane-drone designed to fly with a 2kg cargo. It had two different Arduino boards controlling different parts of the operation of the drone: telemetry + flight control, and battery management. They made their own PCBs, installed telemetry equipment, and even implemented a text to speech mechanism so that anyone with a walkie-talkie in the 433Mhz band could connect to the drone and listen to it saying aloud all of the sensor data. See here the interview I made to Julian, one of the boys in the team. When asking teachers and students how they managed to get so many incredibly relevant projects made during the formal education time, I got a uniform response from them: you (teacher) need to change you class’ methodology and follow PBL centred one. Furthermore, the lab needs extra opening hours. According to the educators, kids demand the technology class (or dedicated lab) to be opened after lunch time, once the class-day has come to an end, for them to continue experimenting and building their projects. Different schools figured out different ways to make it happen: teachers spend some administration hours sitting in the lab and let the kids do, teachers delegate responsibility in older students that want to volunteer and help their schoolmates, the lab management was included in the school’s library management that had to be opened anyway, etc. This is again something we have experienced with CTC. Technology needs to become much more transversal and become part of different subjects, labs have to be open longer, we need to re-think the management of creative spaces at schools, and the school management has to integrate these activities as part of the overall pedagogic plan of the school. Technology is an important part of our lives, and at school it has to play the same role and have resources at the same level as gymnastics, physics, or other classes in the need for experimental settings. 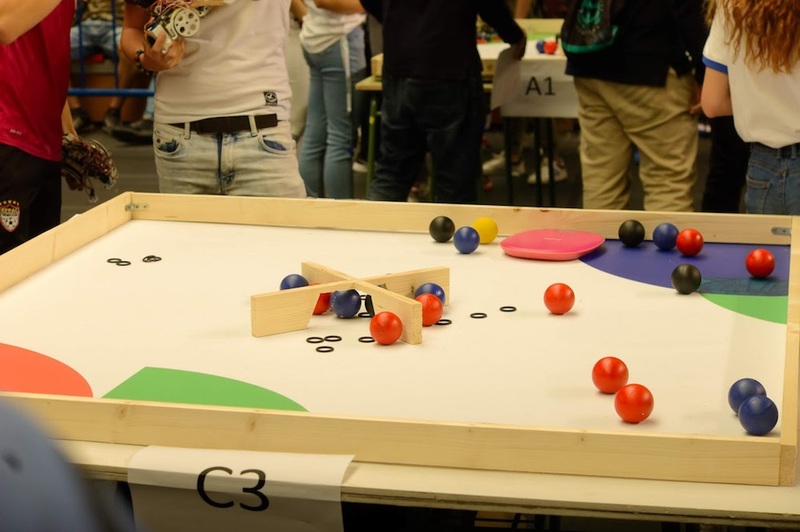 Robolot: A two-day robotics festival now in its 17th edition, which took place in Olot, and included robotics competition, a STEAM area, had workshops, lectures, and other side events. FanTec: The technology teachers association from Andalucia celebrated the 3rd edition of their faire at the Faculty of Telecommunications and Informatics at the University of Malaga. They have an extensive program with a long selection process, prizes, and visits to museums. ROByCAD: Cadiz, also in Andalucia, hosted its first robotics day on May 25th. Granabot: Once more in Andalucia, a couple of enthusiast teachers arranged two days of activities including Arduino Day. Cantabrobot: In northern Spain, a small robotics festival in Colindres, Cantabria gathered 700 enthusiasts. To the question of who paid for all of these, typically teachers arrange the events on a volunteer basis, get donated spaces from the regional or local governments, prizes contributed by companies, and sometimes even received grants to help those having to travel long distances to participate in the event. All the images featured in this blog are courtesy of ColePower.